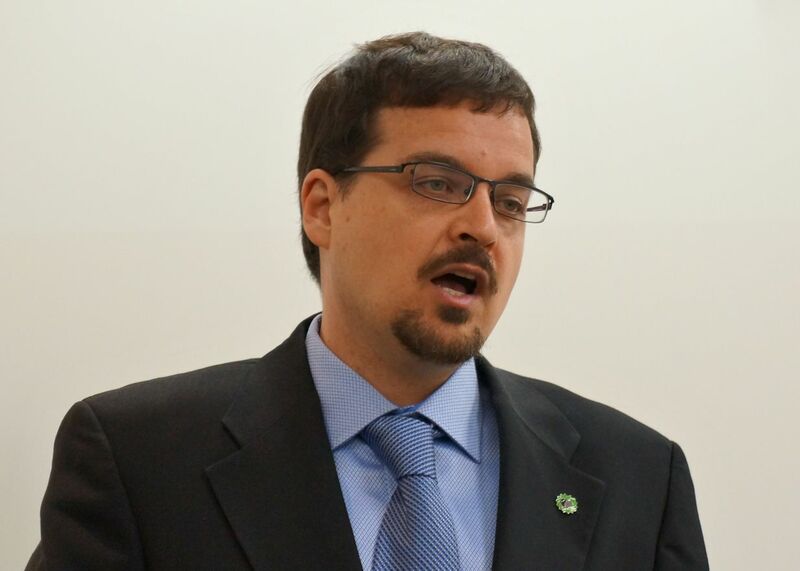 April 13, 2015: Wolseley Green Party candidate explains the dangers posed by the proposed Energy East Pipeline at a news conference in Winnipeg. (Winnipeg, April 13, 2015) By providing an outlet for Alberta oil sands crude, the Energy East pipeline will magnify the Alberta oil sands impact on global climate change. The proposed Energy East Pipeline project is essentially a plan to move corrosive diluted bitumen from Alberta to New Brunswick. It involves the conversion of 3,000 km of nearly forty year old natural gas pipeline in Saskatchewan, Manitoba and Ontario, and the further construction of 1,600 km of new pipeline in Alberta, Ontario, Quebec, and New Brunswick. There are six natural gas lines operated by TransCanada Pipelines running in a corridor from the Saskatchewan border to Ile-des-Chenes where they split with three lines continuing westward. One of these old gas lines would be the Energy East line. These pipelines are fourty years old. Constructed mainly in 1971 and 1972, the original asphalt tape exterior coating has deteriorated in some areas, so that the pipeline is no longer protected from stress corrosion cracking. There is a significant risk of rupture and explosion of the proposed Energy East pipeline from a nearby natural gas line. These gas pipelines are subject to corrosion and wear and have ruptured four times in Manitoba in the last twenty years: at Rapid City in 1995, St. Norbert in 1996, Brookdale in 2002, and Otterburne in 2014. An explosion and black toxic smoke plume form a diluted bitumen fire could necessitate the immediate evacuation of the entire population of Winnipeg should it occur nearby. Many communities draw their water from rivers that the pipeline directly crosses including Portage La Prairie, Starbuck, Sanford, Kenton, Rivers, La Salle Rivers, Brandon, Selkirk and Sioux Valley; and the pipeline cuts directly over two major surface aquifer–the Assiniboine Delta and Sandilands. One of the worst spills of dilbit occurred in Michigan on the Kalamazoo River in 2010. The spill was 3.3 million litres and affected about 60 kilometres of river. The diluent portion of the dilbit floated and emitted toxic fumes that required the temporary evacuation of residents along the river. The bitumen portion of the dilbit sank in water and mixed with sediments making clean up next to impossible. After four years of cleanup at a cost of one billion dollars, it is now recognized that the spill cannot be completed remediated. If it goes ahead, the Energy East Pipeline will threaten the health and safety of thousands of Manitobans who live in 25 communities along the proposed route. Premier Greg Selinger and the NDP government can and must do something to protect Manitobans and the planet—and that’s to say ‘no’ to the Energy East pipeline in Manitoba.